First, and most urgently: Rivertree Kitchen’s molasses cookie recipe is a finalist in a Whole Foods cooking contest! If you’re reading this before January 12, 2013, head over and vote for us! On to business: Lately my friend and fellow culinary aficionado Tom (known as Thomas Arthur, to distinguish him from my Tom, Thomas Matthew) has been extolling the virtues of the pressure cooker. He had an ulterior motive: he just bought a new pressure cooker, and wanted me to buy his old one. I spent a recent Saturday morning at his house, learning the ropes while Tom and his wife made chicken cacciatore for their a party. Nine minutes, people. Yes, once the pressure cooker was up to speed, it took nine minutes to take that poultry from raw to fall-apart, cooked-all-day deliciousness. Needless to say, I headed home with Tom’s second pressure cooker (at a bargain price; thanks, T.A.). I cooked a vat of wild rice the same day; it took 20 minutes for 7 cups of cooked rice. Since then, I’ve been surfing for intriguing pressure cooker recipes. Pressurecookingtoday.com had many tempting dishes. We chose this recipe to try because we’re big fans of Thai peanut sauce. I tweaked this recipe just a bit, reducing the level of soy sauce so I could salt the chicken before it browned, and adding a little brown sugar for balance. I also replaced the hot pepper flakes with sriracha; there’s nothing wrong with hot pepper flakes, but I’ve been on a hot sauce kick lately. Since I generally start sautéing onions and garlic while I decide what to make for dinner, I added both to this recipe. We had a handful of frozen pearl onions left over from our New Year’s Eve fondue (a future post); otherwise, chopped onions would be fine. The caramel-colored sauce is creamy and smooth, with a delayed heat from the ginger and sriracha. 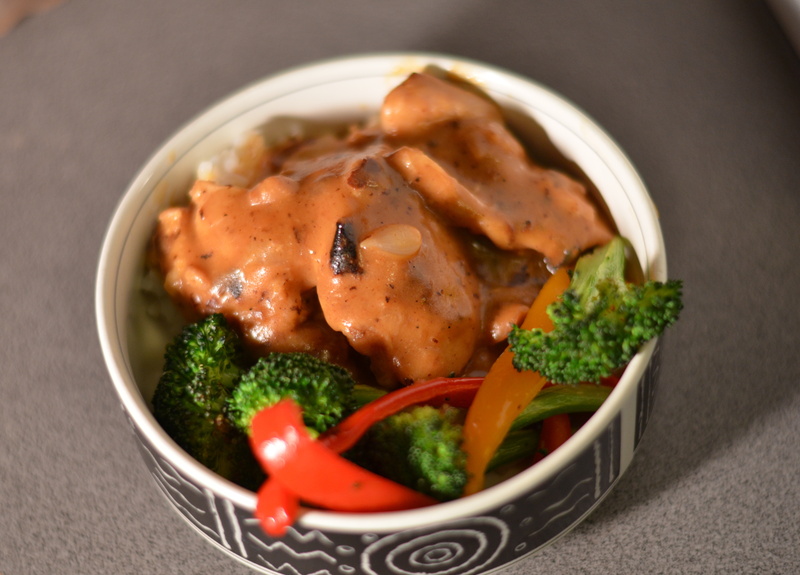 The flavor permeates the chicken, which is fall-apart tender. I served it over steamed rice with roasted broccoli and bell peppers. It would be equally fabulous over soba noodles with shredded carrots. Amazingly, it took less than half an hour, counting prep time. In a small bowl, whisk together 1/2 cup of the chicken broth, soy sauce, lime juice, ginger, sriracha, peanut butter and garlic. It may not combine well at this point; that’s fine. Sprinkle the chicken lightly with salt and pepper. Heat the oil in the pressure cooker over high heat until hot but not smoking. Add half the chicken and cook for 3-5 minutes per side until nicely browned. Remove the browned thighs to a bowl and repeat with the remaining chicken. Remove those thighs when browned. Add the onions; cook for 2 minutes until softened, stirring to scrape up the browned bits. Add the sauce and bring to a boil, stirring. Add the browned chicken along with any juices. Stir once to coat the meat with the sauce. Place the lid on the pressure cooker, lock it, and bring to high pressure. When the top valve begins to rattle (or when your pressure cooker reaches full heat), set the timer for 9 minutes. When the timer goes off, use the quick-release method (in my case, this means placing the pot in the sink and running cold water over it until the steam stops releasing and the valves descend back into the lid). Remove the lid and place the pot back on the stove over medium-low heat. In a small bowl, whisk together the remaining 1/4 cup chicken broth with the cornstarch. Whisk about half the cornstarch mixture into the sauce and bring it to a boil. Cook for a minute or two until the sauce thickens. Add more cornstarch mixture if you want a thicker sauce; stir in a little extra broth to thin it out. Serve over rice (preferably brown) or soba noodles. This entry was posted in main courses, meat, poultry,and fish and tagged Asian, braise, chicken, chicken thighs, peanut, peanut butter, pressure cooker, thai. Bookmark the permalink. This recipe looks AMAZING! I only recently bought a pressure cooker so I’m learning how to use it and trying out new recipes. At first I wasn’t sure which one to buy and what to look for but I found Cook With Pressure which really helped me. My only advice for new pressure cooker users is to do your research and just have fun with it. It makes cooking in the kitchen simple and a real joy!